Top of Page When the FCC allocated new frequencies for FM radio and television broadcasting after World War II, the frequencies chosen were believed to support only "line of sight" propagation. This would insure reliable local service and prevent stations from suffering interference from distant stations on the same frequencies. Happily for DXers, the FCC was wrong. While frequencies above 54 MHz (the start of TV channel 2) normally support only line of sight propagation, there are several occasions each year when TV and FM signals from hundreds or thousands of miles away can be received on ordinary television sets and FM radios. No special equipment is needed, either. A cheap indoor "rabbit ears" antenna is adequate for pulling in spectacular TV and FM DX, for example. It is not surprising that the FCC thought that TV and FM frequencies would be immune from long distance propagation, because the conditions that produce it are irregular, comparatively rare events. Long distance propagation on frequencies below 30 MHz is a regular, highly predictable phenomenon. On the TV and FM frequencies, however, it is unusual and largely unpredictable (although certain times of day and the year are more likely to experience it than others). Catching TV and FM DX is largely a matter of being on the right frequency at the right time! The main sources of DX reception on TV and FM are sporadic-E and tropospheric ducting (or "tropo" as it is commonly known). Another source is "scattering" of signals off the ionized trails left by meteors. And, during years of exceptionally high sunspot activity, frequencies as high as TV channel 2 can be propagated via the ionosphere like a shortwave signal. Sporadic-E propagation is caused by patches of intense ionization in the E-layer of the ionosphere (approximately 35 to 60 miles above the Earth's surface). Signals on frequencies above 30 MHz normally pass through the ionosphere and into space. However, sporadic-E "clouds" are capable of refracting such signals back to Earth. The term "clouds" is an apt way to describe the patches of highly charged particles that form during a sporadic-E event. Like clouds, these patches move and are highly irregular in size and shape. It is possible to track the movement of a sporadic-E "cloud" by noting the locations of stations that fade in and out on a frequency as the cloud moves. Sporadic-E propagation can occur any time of day or year. However, sporadic-E is most common from about mid-May to late July, with another peak a week before and after the winter solstice. Sporadic-E seems to be most common from about mid-morning to noon, local time, and again from late afternoon through the evening hours. The highest frequency that can be received via sporadic-E depends on how intensely ionized the cloud is. Sporadic-E is first noticed on TV channel 2 and then "rises" in frequency as the ionization intensity increases. Next affected are TV channels 3 and 4, followed by TV channels 5 and 6, and then the FM broadcast band. Only in very rare cases will sporadic-E propagation reach TV channel 7 or higher. A sporadic-E opening might "stall" at a certain frequency and go no higher. This means, for example, that you could be seeing distant TV stations on channels 2 and 3 yet conditions might be normal on other channels and the FM band. The first sign that a sporadic-E event is starting is usually "rolling" black bars across TV channel 2 (or the appearance of signals on that channel if you have no local stations on it). As the ionization level increases, channels 3, 4, 5, 6, and the FM band becoming filled with signals. During sporadic-E propagation, signals can abruptly appear or disappear. Signals are usually very strong during sporadic-E. Ordinary "rabbit ears" are adequate for sporadic-E reception, and are preferred by some TV and FM DXers because they can be sharply directional. Tropo propagation is caused by temperature inversions in the troposphere, the region of the atmosphere closest to Earth where all weather takes place. A temperature inversion is a point where air temperature actually increases with elevation. These often form along stationary or occluded weather fronts. A radio signal above 54 MHz in a temperature inversion is like water in a pipe; it is "trapped" and gets bent over the horizon for hundreds of miles. The effects of tropo propagation increase with frequency. Tropo is far more common on the FM band and TV channels 7 and higher than it is on channels 6 and lower. Unlike sporadic-E, tropo signals tend to be steady, although usually of weak to moderate strength. Tropo propagation along a stationary weather front can last for hours or even days. Since signals are not as strong as sporadic-E, you will need an outside antenna to take full advantage of tropo. Tropo is rare west of the Rockies, although it does happen along the California coast. It is far more common east of the Rockies, where warm, humid air masses from the Gulf of Mexico frequently meet drier, cooler one arriving from the Northwest. Tropo can happen along the line where those air masses collide. Hazy, foggy, and smoggy weather is a good sign that tropo propagation is possible. Tropo is most common during spring and fall, and during extended periods of humid, windless weather in summer. A rare but exciting form of propagation is meteor scatter. The ionized trail left by a meteor burning up in the Earth's atmosphere is capable of refracting radio signals much like sporadic-E. Depending on the size of the meteor and the length of the trail it leaves, meteor scatter propagation can last from a second or two (called "pings") to over two minutes. Most reception times will be less than 30 seconds, but you may get lucky enough to hear (or see) identifying material during that interval. Like sporadic-E, meteor scatter mainly affects channels 2 to 6 and the FM broadcast band. You can run across meteor scatter anytime, but the best time to try for it is during one of the yearly meteor showers that brings out stargazers. One of the most productive showers for meteor scatter DX is the Perseids, which peaks around August 12 of most years. There are other showers throughout the year, and you can find information about them, including projected times of their peak intensity, in astronomy magazines. During years of exceptionally high sunspot activity, as was the case in 1990 and 1991, the F-layer of the ionosphere is capable of refracting signals above 54 MHz. Channel 2 is the most affected, with some rare propagation of signals on channels 3 and 4 as well. During these times, truly phenomenal DX is possible. For example, a TV station on channel 2 in Hawaii has been received in Florida via F-layer propagation! As sunspot numbers increase, F-layer propagation above 54 MHz should again be possible. If you are interested in chasing TV/FM DX, you may be interested in joining the Worldwide TV/FM DX Association. Their monthly bulletin contains information about recent TV/FM DX receptions plus articles on techniques for enhancing reception. Click here to visit the Worldwide TV/FM DX Association website. The club website even includes a free database of all FM stations in US, Canada, Mexico and Caribbean. If you have cable, invest in a simple "rabbit ears" antenna for your television, and maybe do the same for your FM stereo receiver. You might be really surprised at what you can see and hear with a little luck! And it you get smittin by the FM DXing bug, there are modestly priced, high performance antennas such as the Term FM Pro are available. 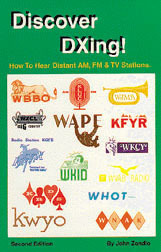 For further information on DXing the FM & TV bands (plus AM) we recommend . . .
A great introduction to DXing the AM, FM and TV bands. Topics include: propagation, seasonal conditions, equipment, antennas and reference materials. Chapters on: best bets for hearing fifty states on AM, clear channel AM stations and VHF TV stations by channel. Second Edition. ©1998 Universal Radio Research. 90 pages.